They are afraid of you. They don’t trust you. They’re not interested in truth, but should they stumble on it, they’ll grab it, put it behind their back, switch hands, and then present it in a way that allows for only one interpretation: theirs. Andrew once said they have contempt for you. They are the elite media…and you are the American people. With the election fast approaching and an incumbent President, who by all historical measures should not win re-election, the media elite is waging its own campaign: one that consists of skewed polls, manipulated samples, misinformation, and proclamations of inevitable victory. They want to break your spirit. They need to break your spirit. Because you have power. Interesting title. 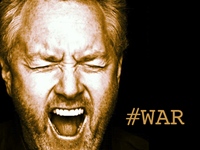 Why was Andrew Breitbart hated by the left and the mainstream media? Why was there so much contempt? Why did he matter? Simple: because he understood them, and because every single day he woke up and he said you will never ever break my spirit…and that is power. The election is fast approaching. Watch this trailer. See the movie October 12. Then ask yourself one question: not what would Andrew do? Ask yourself this: what would you do?